Welcome your kids back to school with these great student name plates. Hopefully you'll find them useful not only for classroom management but use them to create a great learning environment in your class. This is a set of 43 student name plates. There is one plate for each of the 44 Presidents of the United States. There are only 43 because Grover Cleveland was the 22 and 24 President of the US. They are in black in white which will help you to save on printer ink, but it also gives you a chance to have a fun first day of school activity. The way I envision the activity to go is like this. On the first day of school I'll only have a piece of tape with my students names on it so that they know where to sit. Then as a back to school activity I'll have each student pick one president to have as their student name plate. Once they've chosen their President they will be able to personalize the desk label by coloring it in. I'd have them write their name on the back of the name plate so that I could write out their names after school so that each of their names are legible, and then have them laminated. Later on in the year I would also have them research the President that they have chosen and present their research to the class. So on the very first day of school it will set up the expectation in the class that they will be learning throughout the year. Each name plate has a motivational quote from one of the Presidents. So think of it, each day your kids will come to school and will be able to read a motivational quote to encourage them to build character and work hard in class that day. Below I've chosen a few of my favorite quotes from the collection so you can see a preview of what is included in this product. All-right, so this isn't exactly inspirational, but it wasn't that easy to find a good quote from President Garfield. Do what you can, with what you have, where you are. - Theodore Roosevelt. If you like the clipart that I used to create these student name plates I plan on creating a clipart collection and selling them soon, and yes I did create all of the president clipart for these name plates. This collection has 6 different monster themed student name plates. 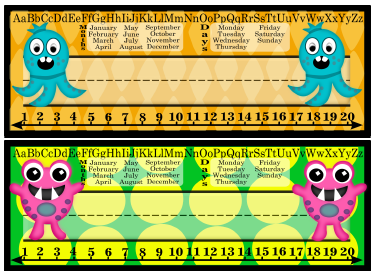 Its perfect for your monster themed classroom. 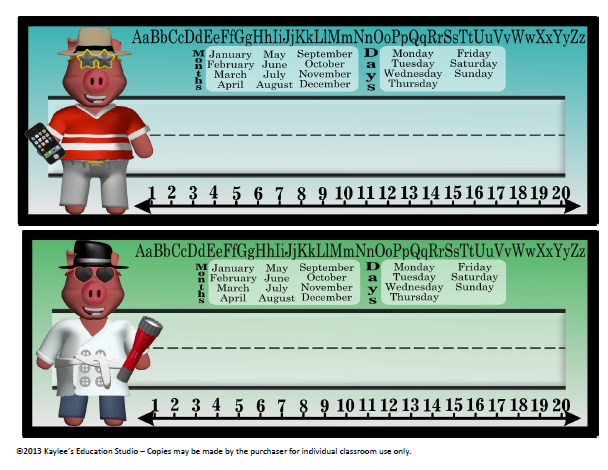 These are pig themed name plates for your students desks. 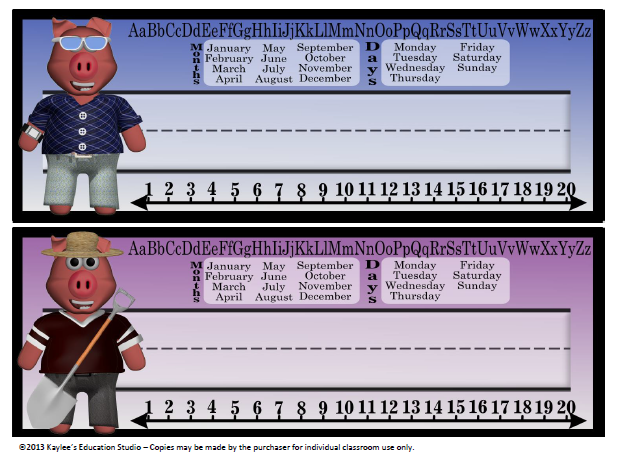 The pigs are from my Spy Pig sight word games. There are 4 name plates in all, the ones that you see below. 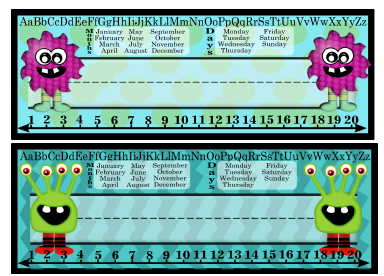 Each one has the months of the year and days of the week as well as the alphabet and a number line.